Chinchwad, Pimpri Chinchwad, Pune. Near Aditya Birla Hospital. How Far is Alliance Pink Lily? 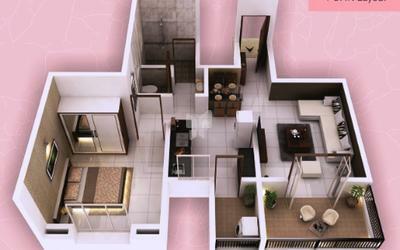 Alliance Nisarg Pink Lily is one of the popular residential developments in Chinchwad, neighborhood of Pune. It is among the ongoing projects of its Builder. It has lavish yet thoughtfully designed residences in 1 Blocks. Internal oil bound distemper (NEROLAC/BERGER). 6”/4” thick bricks/fly ash bricks/ACC block for external and internal walls. External sand faced, sponge finished plaster for increased protection from weathering and formations. Smooth neeru finish plaster for internal walls. Good quality (water-proof) internal flush doors with S.S. cylindrical locks. Powder coated M.S. doors for terraces. Marble / Granite door frames for toilets. 24" x 24" vitrified flooring. 12”x 12” anti-skid tiles in toilets, terraces & dry balcony. 2 track superior quality powder coated aluminum sliding windows. Mosquito net, safety grills & granite sills. Clear 4mm glass (asahi/modi or equivalent). Designer glazed wall tiles up to lintel level. Provision for geysers & exhaust fan. Hot & cold mixer unit in the bathrooms. JAGUAR or equivalent CP fittings. TV. and Telephone points in the living and master bedroom. Anchor Roma or equivalent switches. Adequate electrical points in the entire flat with MCB & ELCB. A. C. Point in master bedroom. Granite kitchen platform with single bowl stainless steel sink. Provision for exhaust fan & water purifier.